The Not So Silent Auction Fundraiser! Silent Auction, Live Auction and Chinese Auctions of Baskets. The Oswego County Historical Society will host its first lecture of the 2018 series on Sunday, April 22 at 1:30 p.m. at the Oswego Public Library at 120 E. Second St., Oswego. Joyce Cook, retired librarian and past director of the Fulton Public Library will present a program based on her new biography titled "Elimina Spencer: Oswego's Civil War Battlefield Nurse." Oswego County Historical Society Annual Meeting will be Saturday, May 19 at 1:30 pm at the Oswego Elks Lodge, 132 West Fifth Street Guest Speaker — Ann Callaghan Allen, Biographer Presentation Titled: “The Extraordinary Life and Tragic Death of Madame Malvina Dean Guimaraes” An Oswego history account of a rags to riches story more fascinating than fiction. Madame Guimaraes owned the home that now houses the Oswego Elk's Lodge on the corner of West Fifth and W. Bridge St.
Tour the grounds of the lovely Riverside Cemetery in special tour buses. View historic monuments and learn about some of the famous residents of Oswego. Reservations taken. Please call 315-343-1342. Bus tour to Historic Auburn NY with stops at the Seward House Museum and the Harriet Tubman National Historic Park, and lunch is included at Parker's Grille, a downtown pub. Oswego Cinema 7, 138 W. 2nd St.
Classic Movie Night at the historic Oswego Cinema. 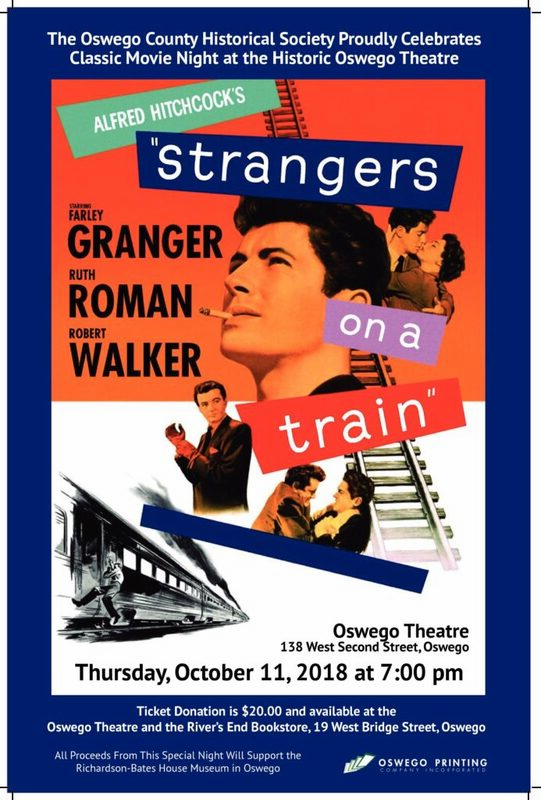 Film Noir thriller: "Strangers on a Train"
The Oswego County Historical Society will host a lecture entitled “A Saint Amongst Us: The Life of St. Marianne Cope” on Sunday, October 21 at 1:30 pm. A presentation will be given in the St. Marianne Cope Hall located behind St. Peter’s Church at 83 E. Albany St. in Oswego. St. Marianne Cope served as the Mother Superior of the former St. Teresa Convent and principal of the former St. Peter’s Church Catholic School in Oswego in the 1860s. On October 21, 2012 she was canonized as a Saint in the Vatican. This year marks the 100th anniversary of her death in 1918.